In the report on the British Silent Film Festival I covered the Amundsen polar films. What I didn’t mention is that the films have been included in UNESCO’s Memory of the World programme. It seems worthwhile just taking a look at Memory of the World and identifying those silent films which are registered on it. The vision of the Memory of the World Programme is that the world’s documentary heritage belongs to all, should be fully preserved and protected for all and, with due recognition of cultural mores and practicalities, should be permanently accessible to all without hindrance. To facilitate preservation, by the most appropriate techniques, of the world’s documentary heritage. To assist universal access to documentary heritage. To increase awareness worldwide of the existence and significance of documentary heritage. In practice the Memory of the World means a register of the world’s archival gems. Archives, museums and libraries vie with one another for the honour of having their prized items listed on on the register (though nominations are by country, not by institution). There’s no monetary gain involved: merely glory, plus all the strength and worldwide recognition that comes from UNESCO’s backing. Consequently it is quite an achievement for the silent films and film collections that have made it to the register, although together they present a rather uneven picture of what is most precious about the world’s early film heritage. These are the silent films (with their nomination details) currently on the register, alongside such world treasures as the Bayeux tapestry, the diaries of Anne Frank, Magna Carta and Criminal Court Case No. 253/1963 (State Versus N Mandela and Others). Documentary heritage submitted by Germany and recommended for inclusion in the Memory of the World Register in 2001. Fritz Lang’s motion picture METROPOLIS (1927) is without doubt famous testimony of German silent film art, a testimony that made history. The combination of motion picture and architecture: this is above all and still METROPOLIS, the film which was shot by Fritz Lang in the Babelsberg Film Studios in 1925/1926, which, due to its immense expenditure, caused the UFA, the largest German film group, to run into financial difficulties, which then had a glittering première in Berlin in January 1927, and an unparalleled success all over the world ever since – and which became the symbol of a (film-) architectural model of the future. Substantially shortened and changed almost immediately after the première in Berlin, only one (though fragmentary) of the initially three original negatives of METROPOLIS has been left in the possession of the German Federal Archives, as well as master copies of the lost original negatives in a few archives abroad. As a result of intense investigations on the initiative of the Friedrich Wilhelm Murnau Foundation, a new reconstruction has been produced. It was first shown in February 2001, on the occasion of the Berlin Film Festival. Considering that the result this time is again not the original version of METROPOLIS, but “only” a synthetic version made of the fragments handed down, it comes, however, as close to the original piece of work as possible. With this reconstruction project a new digitized “original” negative has been produced to provide more independence and better copying quality in the future. This reconstructed version of METROPOLIS is proposed for nomination here. Documentary heritage submitted by France and recommended for inclusion in the Memory of the World Register in 2005. The collection nominated for inclusion in the Memory of the World Register comprises all the original films (negatives and positives) known as the Lumière films (i.e. having round perforations) and listed in the catalogue of 1,423 titles produced at the factory of the brothers Louis and Auguste Lumière. Since 18 films have been lost, the collection comprises the original films of the 1,405 Lumière titles that have been identified and restored. Documentary heritage submitted by Norway and recommended for inclusion in the Memory of the World Register in 2005. Roald Amundsen and his 4-man team reached the South Pole, with the help of polar dogs, on 14 December 1911. The expedition, and particularly the dog-sled journey to the Pole, is described as daring and with an exceptionally good logistic planning and execution. The Antarctic and the Arctic Polar Regions, for several centuries, were regarded as the final frontiers for mankind to conquer, and the North and South Poles were for a long period of time the great goals to attain within geographic discovery. The discoveries in the polar areas contributed, not least in Norway but also internationally, to greater consciousness of, and political interest in, questions concerning sovereignty and rights in these sea and land areas. The original film material of Roald Amundsen’s South Pole Expedition documents a great historic achievement, outside the borders of the civilized world and in an extreme climatic environment. In his time, Roald Amundsen (1872 – 1928) contributed, through several expeditions and together with his teams, to new knowledge within several aspects of polar research. First and foremost, however, he is remembered as a master of the classic polar expedition’s planning and execution. The film collection is unique, as it documents the important events of this first expedition to reach the South Pole. 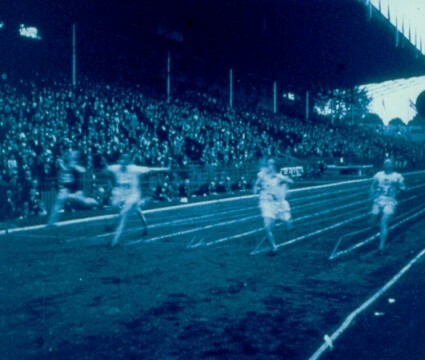 Though the material is incomplete, it is made up of original sequences, filmed between 1910 and 1912, consisting of negative film and first and second-generation print material. Documentary heritage submitted by United Kingdom and recommended for inclusion in the Memory of the World Register in 2005. Finally, it has importance as one of the foundation stones of the film collection of the Imperial War Museum, an institution that may claim to be among the oldest film archives in the world. Just as Fritz Lang’s Metropolis (1927) is testimony to German silent film art, The Story of the Kelly Gang (1906) symbolises both the birth of the Australian film industry and the emergence of an Australian identity. Even more significantly it heralds the emergence of the feature film format. The Story of the Kelly Gang, directed by Charles Tait in 1906, is the first full-length narrative feature film produced anywhere in the world. Only fragments of the original production of more than one hour are known to exist and are preserved at the National Film and Sound Archive, Canberra. The original poster and publicity booklet provide confirmation of those fragments’ authenticity and together this material represents the unique and irreplacable beginning of feature film culture. What is striking is just how much film is represented on the register so far. As well as the above, from the sound era there is Luis Buñuel’s Los Olvidados (1950), Norman McClaren’s animation film Neighbours (1952), The Wizard of Oz (1939), the Ingmar Bergman Archives, and the John Marshall Ju/’hoan Bushman Film and Video Collection – though one might query the documentary value of some of these choices. The prominence of film can be seen by looking an individual countries: there have been five items registered by the UK – the Hereford Mappa Mundi, Magna Carta, the Registry of Slaves of the British Caribbean 1817-1834 (submitted by the UK and Caribbean nations), the Appeal of 18 June 1940 (a radio broadcast, submitted by the UK and France), and The Battle of the Somme. Not everyone would argue that The Battle of the Somme should be among the UK’s top five archival treasures (though I would), and its presence there is due in part to the strong arguments made in its favour by its host archive, the IWM – but nevertheless film is there on the register, again and again. It is not only heartening, but it adds significant strength to the arguments of archives that need to argue the case for the preservation of film as a medium equal to any other. Celluloid is the equal of vellum. The individual records for the films listed above are worth checking out because there is a link to the nomination forms, which give much supporting information (in English and French) on the films’ preservation and current status. There are also some photographs. But if you were picking five examples of silent film heritage to represent the world’s documentary heritage, would you have picked those five – or what would you argue should be included? Finally, the restored Roald Amundsen’s South Pole Expedition film is to be made available on DVD from the Norwegian Film Institute on May 6th – details here. Once again an interesting entry in The Bioscope. One of the reasons why I started my research on Roald Amundsen´s film from his South Pole Expedition was to find it among those few films listed on Memory of the World. I was surprised to find the film there. How could this film footage be of value to the world? As a film historian and a film enthusiast it was easy to see that this was no masterpiece in national or international film production. The Memory of the World-list do not look for masterpieces. All documents on the list is required to fulfil a minimum of two out of six criteria in order to be of value to the world – linked to central concepts like influence, time, place, person, theme, form or style. Someone in the Norwegian Film institute (NFI) and the National Library argued to get Amundsen´s film into the list. the original manuscript for Henrik Ibsen’s A Doll’s House, the original sheet music for Grieg’s Concert in A Minor, and the film Roald Amundsen’s South Pole Expedition (1910-1912). This short film includes images of the Fram in Horten before the departure for the South Pole. We see the loading of dogs and provisions, daily life on board, a pig being slaughtered. There is celebration and partying as the ship crosses the equator. There is a whale sighting, the Fram at anchor in the Bay of Whales, dog sleds on the ice, and the distribution of supply depots before the actual trek to the South Pole begins. was far-sighted, and the documentation is unique – this is the earliest infancy of film! Later, during his many attempts to reach the North Pole, he provided a broad photographical coverage, with both film and photographs. These films and Amundsen’s authorship contributed significantly to the funding of his many expeditions. UNESCO’s exclusive collection of the Memory of the World includes few other films. From France came the Lumière brothers’ films from 1895, from Australia, The Story of the Kelly Gang (Tait 1906), from Great Britain, The Battle of the Somme (1916), from Germany Metropolis (Lang 1927), and from Sweden the entire Ingmar Bergman archive. The only film from the USA is The Wizard of Oz (Fleming 1939). What exactly do we know about this Norwegian film segment of the Memory of the World? The Memory of the World II. Amundsen’s film is no cinematic masterpiece, but still a document providing us with plenty of information on polar expeditions, on the spirit of the age, on our film history, and on Amundsen. To photograph or make a film was not a priority for Amundsen and his men on the South Pole expedition. The fact that Amundsen won the race to reach the South Pole is of course the principal reason why the film is included in the exclusive UNESCO list. To bring along the best contemporary film photographers proved not to be of great help to the “losers.” The winner’s story is the one being written/filmed/documented. And to those of us who have watched the other films, the South Pole film is a clear proof that Amundsen’s decision and strategy was the right one. ”The Norwegians were hauled along by dogs, while Scott and his men themselves wore harness and pulled their sledge through ice and snow, across ridges and crevasses.” (Thomson 2002: xiii). Ponting’s film from the “test journey” clearly shows the exertion Scott and his men exposed themselves to. Slowly but safely Scott, Wilson, Oates and Bowers struggle forward with the sled. The film photographer composes the images, and lets the viewers follow the sled team metre by metre. During the few minutes the footage lasted, Scott and his men moved maybe 100 metres. Prestrud’s footage follows the four Norwegian dog sleds for a corresponding amount of time. and his men disappearing into the distance in the course of the few minutes’ duration of the film. We have an even better impression of the efficiency of the dog teams in the second last sequence of the film, where dog teams transport equipment back from Framheim to the Fram. The film photographer has his hands full when panning with the sled in focus. 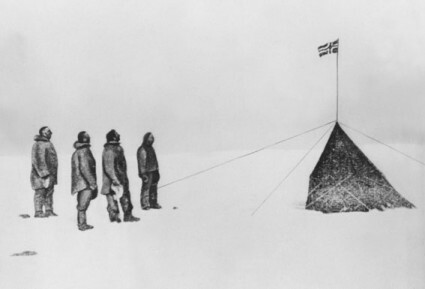 We may question the UNESCO claim that “Amundsen was foresighted” regarding the film, and that the film “documentation is unique.” Amundsen only had one priority; to be the first man on the Pole. He did not need a “live” heroic portrait to dispatch to the cinemas. He wanted to tell the story himself in his lectures, and only use the film as an illustration. However, the South Pole film documents his efficient way of conquering the Pole. By comparing Amundsen’s film footage with the other contemporary films, we clearly see who mastered the conditions. As mentioned, Amundsen’s expedition was not the first to film in Antarctica, and at the time of Amundsen’s expedition, two professional photographers participated as members of Scott’s and Mawson’s antarctic expeditions. Today, only those two photographers – Herbert Ponting and Frank Hurley – are remembered as The Antarctic Photographers. (Cf. among others McKernen 2000: 91 ff. and Boddington (ed) 1979: 16 ff.) Home of the Blizzard (Hurley 1913) and 90 Degrees South or The Undying Story of Captain Scott and Animal Life in the Antarctic (Ponting 1914) are today more well known than Amundsen’s and Prestrud’s footage. There is no doubt that the professionals filmed better, directed more distinct stories, and composed more aesthetical pictures than the Norwegians, who at times hardly managed to film in focus or compose cuts. Even so, The South Pole film is an important documentation of why Amundsen became the first to conquer the South Pole; the film shows how Antarctica could be conquered in “The Heroic Era.” We see some incidental live pictures from the arrival at the Barrier in the Bay of Whales, the establishment of Framheim, but nothing from their lives during the winter, when the experiences from the distribution of depots were made use of to improve the equipment before the actual journey to the Pole. The existing pictures were shot by Amundsen and Prestrud when the filming did not interfere with more important work; they had no photographer who could organize illustrative situations. The South Pole film is of “importance to the world” due to its depiction of famous men and their contemporary way of conquering the South Pole. Thank you for this extract from your DVD notes, and I’m sorry that you weren’t able to present your researches at Leicester. I was thrilled to see the Amundsen film at last, and to learn about the Antarctic films of Bruce (1902) and Shirase (1912) of which I knew nothing. There is certainly more to the Amundsen films that might have been supposed, in an aesthetic sense as well as a documentary sense. It’s interesting to read your argument that the films demonstrate why Amundsen won the race to the pole. There may be something in that, though I don’t think any budding polar explorer in 1912 could have viewed the film and then known exactly what they had to do. We can’t really look on these polar films as documentaries as such – they are witnesses of achievement and extraordinary windows on the past. Ponting’s films of the Scott expedition are immeasurably greater cinematographically speaking, with Hurley’s work for Mawson and Shackleton not far behind, but ultimately each film is a uniquely eloquent witness – just for having been there at a remarkable time.